In 2006, Stéphane Faucourt published his first book – From Meccano to Trilogo, a well-received (and today highly-collectable) reference book that examines the availabilty of French vintage Star Wars toys. 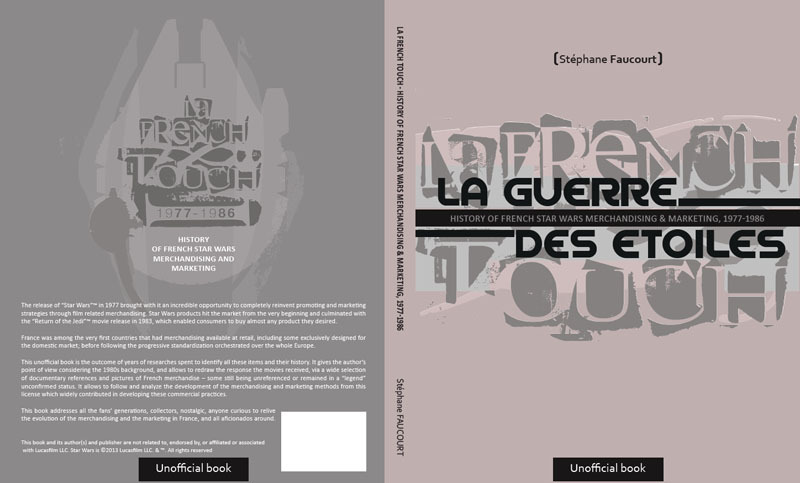 In Stéphane’s latest book – La French Touch – we see a natural progression into the exploration of the history of Star Wars merchandising and marketing in France between 1977 – 1986. La French Touch not only examines the toys and products made available, but also looks into how the films were perceived and the different styles of marketing that were applied. La French Touch explores thoroughly the impact and sensation Star Wars had on France at the time. The book (242 pages) comes packed with many cool photos of authentic French Star Wars memorabilia, complimented with writing that provides not just a fascinating look at how Star Wars was presented to the French public but also an impressive overview of how Star Wars films and toys were originally conceived outside of France. La French Touch is perfect for the seasoned collector and for the newbie taking a first step into the world of vintage Star Wars collecting. TVTA highly recommends adding it to your Star Wars bookshelf today! This entry was posted in Uncategorized and tagged 1970s & 1980s French Star Wars toys, boo, La French touch, stephane faucourt books, thevintagetoyadvertiser.org on July 14, 2013 by The Vintage Toy Advertiser.